Rivera Consulting Inc., seeks to unlock the hearts, skills and minds of our clients using our deep democracy toolkit to produce multi-dimensional social interventions, political, and community empowerment strategies to transform engagement and cross sector collaboration. Among staff and our clients, this work is rooted in consistent innovation within the firm to best reflect a rapidly changing environment driven by major social progress of women and people of color and fueled by increasing income inequality, displacement, and climate change. By promoting a movement building playbook, Rivera Consulting, Inc. is offering a viable and proven alternative to a more representative democracy and a road map for 21st centuries political campaigns. Repeating the playbook in Boston and across the country has not only achieved the same results for the same select few, but has intensified inequality, especially among the largest eligible voting base the American Rising Electorate (millennials, people of color, and unmarried women). At Rivera Consulting, Inc., deep democracy opportunities also exist in places across the country where you have the following synergy of factors: 501c3 and 501c4 organizations leading integrated voter engagement efforts, progressive ballot questions, coordinated donor and field coordination, as well as bold, progressive, exciting women and people of color candidates. We work with organizers, candidates, operatives to identify deep democracy seats, than we work with with donors and philanthropy to make the case for early financial support of these races. As Rivera shared in a recent interview for The Heart of the Matter hosted by Malia Lazu of the Urban Labs, “If the woke aren’t taking the less woke or sleepy to something better, we need to take them on a journey with us.” We need each other to do the work of social change and a thriving team to lead interdependent movement. Our staff and clients continue to be at the forefront - whether it’s changing hearts, helping elect more Democratic women and people of color, or transformative policy change to create a more sustainable Earth. The case for inequality and need for intergenerational change can also be seen in Puerto Rico, a site where Rivera Consulting Inc., affiliate consultant, Cassandra Lopez Fradera, a diasporic Puerto Rican, visits as a healing justice practitioner and communications strategist to make the case for healing justice as a multi-dimensional tool that focuses on restoring dignity to survivors of colonial and domestic violence as well as, co-creating solutions for long-lasting change in the face of re-imaging a new social contract with each other and the larger diaspora. She asserts, as does Rivera Consulting, Inc. that healing is a fundamental part of deep democracy, because it addresses intergenerational trauma and/or poverty as the starting point for social change. 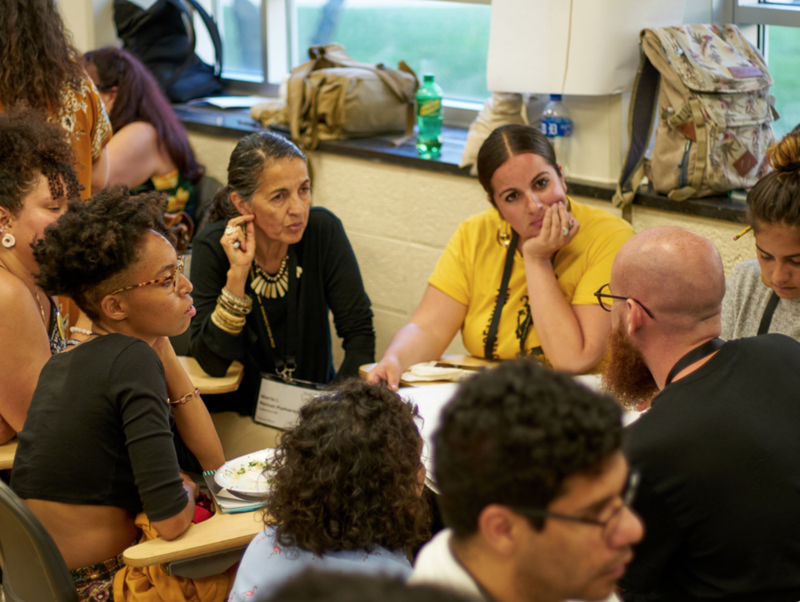 Cassandra’s work supports clients and communities to explore this space as a liberation tool for their voices to emerge and Rivera Consulting, Inc. uses this insofar it helps build trust needed for social change and cross sector collaborations. Marginalized voices are often in spaces that are isolated from discussions and plans to build political power, which proliferates inequality and profit for a select few. In the days that followed Hurricane Maria, which made landfall in Puerto Rico on September 20, 2017, the intergenerational effects of colonization and privatization of public services were shown to the world while the American government delayed their response. Unlike Mexico, where an earthquake of an estimated magnitude of 7.1 hit the night before Hurricane Maria, international aid arrived quickly. Puerto Ricans were isolated from international relief due to the Jones Act, a federal law that regulates maritime commerce in the United States. Only Congress can repeal the Jones Act and because Puerto Ricans cannot vote in congressional or presidential campaigns, it is critical to the engage American politicians and the diaspora continue to create change. Another future is possible. It’s happening around us and in Latin America, where Rivera Consulting, Inc. has partnered with the MIT Community Innovators Lab (MIT-CoLab), AVACA and Conservatorio and embarked on a sustainable urban revitalization project in Santa Ana, Panama. Our approach, inspired by their work with the Bronx Cooperative Development Initiative and our firm’s two Central Brooklyn based participatory action research projects (Brownsville, East New York, Bedford Stuyvesant, Crown Heights, and East Flatbush), was to take an innovative urban American model and contextualize it. What’s in store for the future? Stay tuned and make sure to vote on Election Day (Tuesday, November 6th).